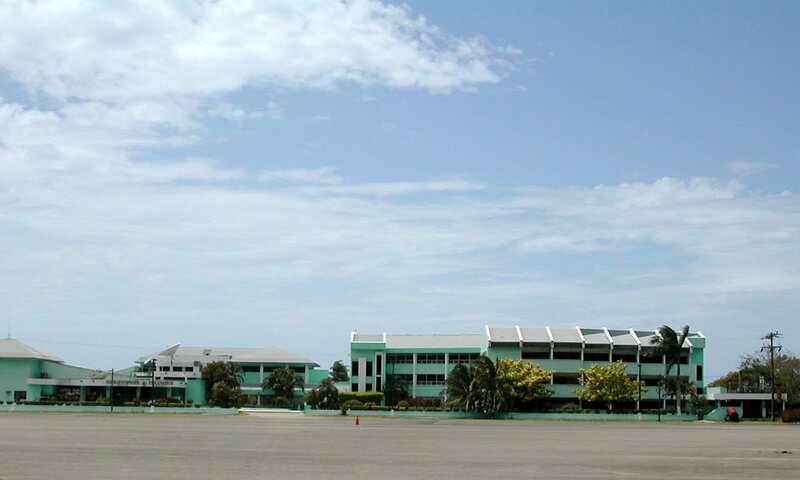 How is the weather in La Ceiba? 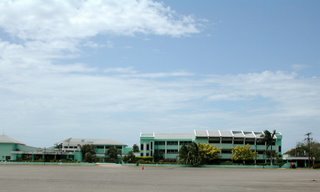 First of all, if anyone wants an official weather report, enter 'La Ceiba Airport' in any of the on-line international weather services. Just 'La Ceiba' won't do. Apparently someone at the airport is in charge of recording the hourly weather, but I don't know how accurate these things are, especially since the airport closes about 6 p.m. See my other weather articles Temperatures − Don't trust them and Rain, rain, go away regarding my doubts of the accuracy of Honduran weather reports. Don't even bother to check the Honduran newspapers. The daily La Prensa predicts tormentas (rainstorms) for La Ceiba approximately 340 days per year (not true) and the few days that it predicts soleado (sunny), it is guaranteed to rain. 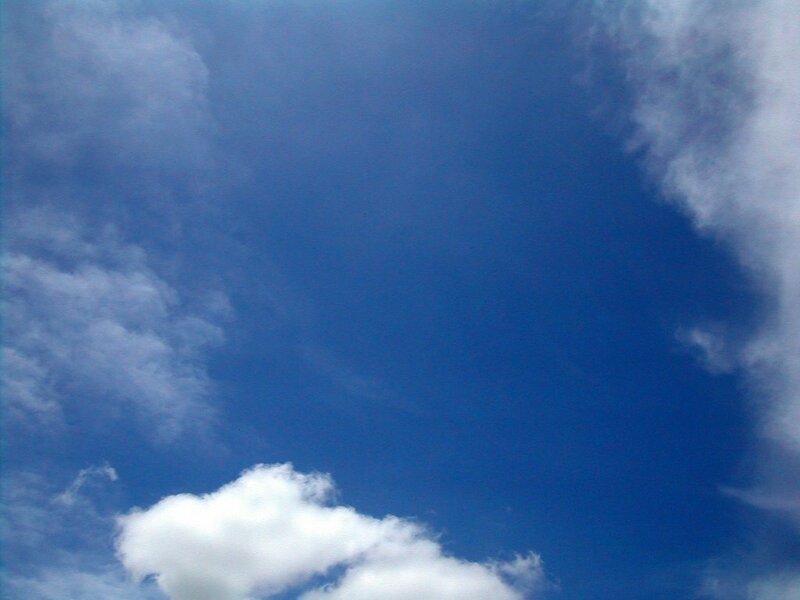 The sky really is very bright blue most of the time with lots of thin white clouds blowing across it. 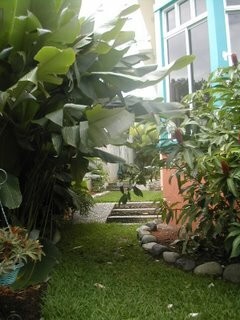 I usually try to take my pictures when it is a little cloudy, otherwise the tropical sun is so bright that all the colors are washed out and the grass looks white. I took a picture of the bright blue sky today. 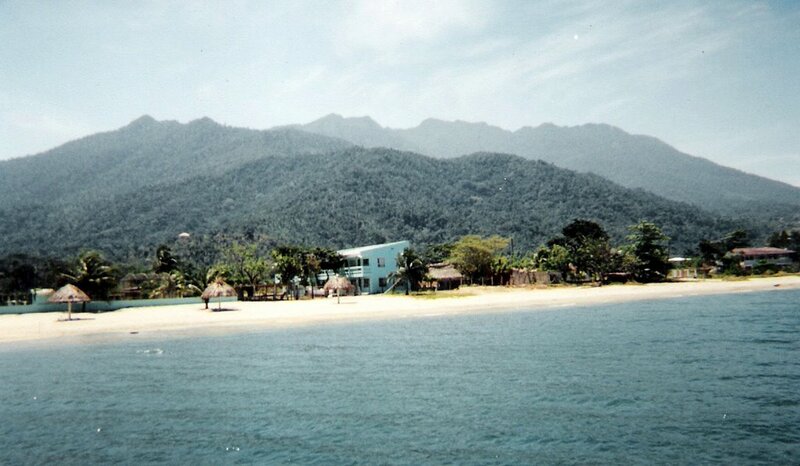 La Ceiba does tend to be cloudy because the breezes from the ocean bring the clouds and then they hit the mountains and start blowing across the coast. (That's my non-meteorologist version.) But it isn't gloomy clouds and a few clouds are welcome. It is very, very hot when there are no clouds. A quick google search for 'Honduras rainy season' shows reports of every different combination of months that you can imagine. Haha! Most Ceibeños will tell you that the rainy season here is roughly September through March. 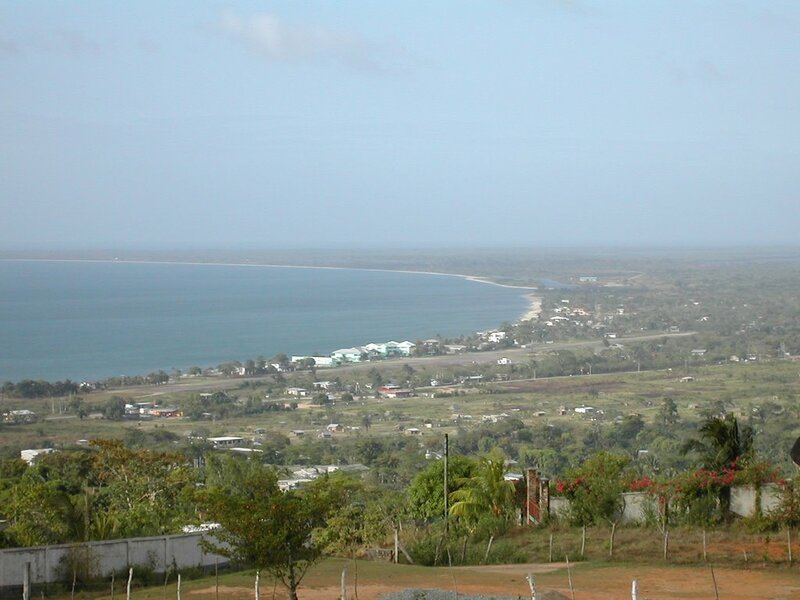 There is not a big distinction in La Ceiba between the rainy and dry seasons. We get rain year round, just more during the rainy season. 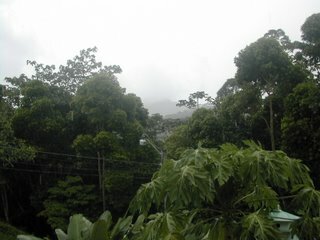 I recently have found out that La Ceiba's rainy season is in different months than much of the rest of Honduras and Central America, which have a rainy season during the summer and a dry season during the winter. The reason is that the north-facing coast of Honduran gets hit by the northern cold front winds coming from Canada and the U.S. as well as the tropical Atlantic storms. The brunt of most hurricanes seem to bypass the north coast (knock on wood), breaking up in the mountains to the south and west of us or turning instead to the Yucatan peninsula of Mexico, Cuba and the southern U.S.
December and January are the only months where we may get a week or more of continuous rain, usually only once or twice each year. That is the only risky time for tourists on a short trip − especially those traveling further into the country since heavy tropical storms frequently wash away roads and tumble bridges. Generally, rain falls after 4 p.m. for some reason that I don't understand. Most rains are just a blip in the day and won't affect your enjoyment as a tourist. Tropical rains can be very intense, but they come quickly and go quickly and everything dries up almost immediately. Hondurans consider February to be the official start of verano (summer) and rarely even use the term invierno (winter). 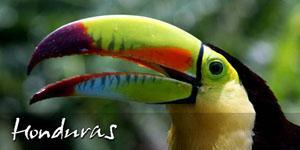 Seasons don't mean much in Honduras − elevation is what marks the difference in climates. In the mountains it can get quite cold, especially at night. San Pedro Sula is generally hotter than La Ceiba and Tegucigalpa is generally cooler. 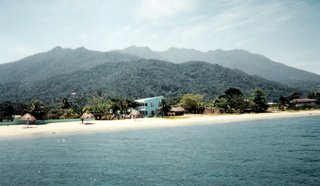 During most of the year, La Ceiba daytime temperatures average in the mid- to high-80's°F (29-32°C) with humidity in the 70% to high-80% range, and temperatures falling to the 70's°F (22-26°C) only occasionally during the winter months. The humidity is the killer, not the temperatures. Nighttime temperatures are not too much lower. I wear shorts year round and have pulled out a sweater or light jacket only half a dozen times in five years. After I wrote this, because I didn't want to be influenced by reading other reports (or as some might say, ;-) I didn't want to be influenced by the facts), I did some research and found this site, Countries of the World - Honduras Climate which seems to have the most accurate description of the Honduran climate. By the way, this is a fascinating site, with detailed information about every country in the world from the U.S. Library of Congress, the CIA Factbook, and the United Nations. It includes rankings in many categories so that you can compare your country with others. Go to the main index of Countries of the World to select another country. I was so enthralled that I could hardly get back to finish this article! So that's La Gringa's unofficial climate report, as unscientific as it is! Honduras decided to observe daylight savings time in 2006. Days are very short in Central America. I have always thought that Central America and the Atlantic side of Mexico were in the wrong time zone. Dawn breaks too early for me and the sun goes down way too early for this night owl. Here in Honduras we have daylight roughly from about 5:00 a.m. to 6:30 p.m. in the summer (13 1/2 hours) and 6:00 a.m. to 5:30 p.m. in the winter (11 1/2 hours). Gardeners know that this has gardening implications, some plants won't fruit or go to seed unless the days are longer. Three months ago, Honduras went to daylight savings time. In May we turned our clocks forward an hour − well, at least parts of the country did. Apparently part of the country just ignored it. I don't know which part, but my guess is that was probably Roatán and the other Bay Islands, since they like to think of themselves as in a separate country anyway. I loved daylight savings time! It was like a free extra hour in every day, since I'm usually asleep during that first daylight hour. It made sense to me, especially since there are so many people who don't have electricity (approximately 40% of the population). Give them an extra hour in the evenings when they can enjoy it. I was hoping we would never change back. Now after only three months, it has been determined that the government has saved "only" 90 million lempiras in energy costs (approximately $4,750,000 U.S.). Why bother for a paltry one million lemps per day which can easily be replaced by donations from the U.S., Japan, or the World Bank? So President Zelaya ordered us to roll the clocks back on August 3rd. 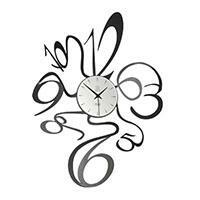 But only for a time; he will be revisiting the issue in November and we may change our clocks again. I'm so confused about this. I don't even know if we would be moving the clocks forward or back in November. 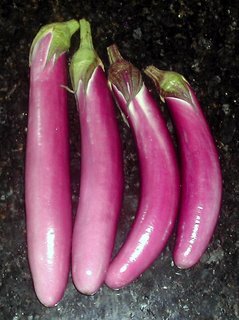 I just can't get over how beautiful this Ping Tung Long eggplant is. Try as I might, I can't seem to capture the color properly in a photograph. 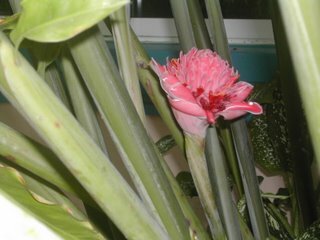 I have two plants, each about 3 feet tall and 2 feet wide (90 cm. x 60 cm. ), which have been producing for two months and are still going strong. 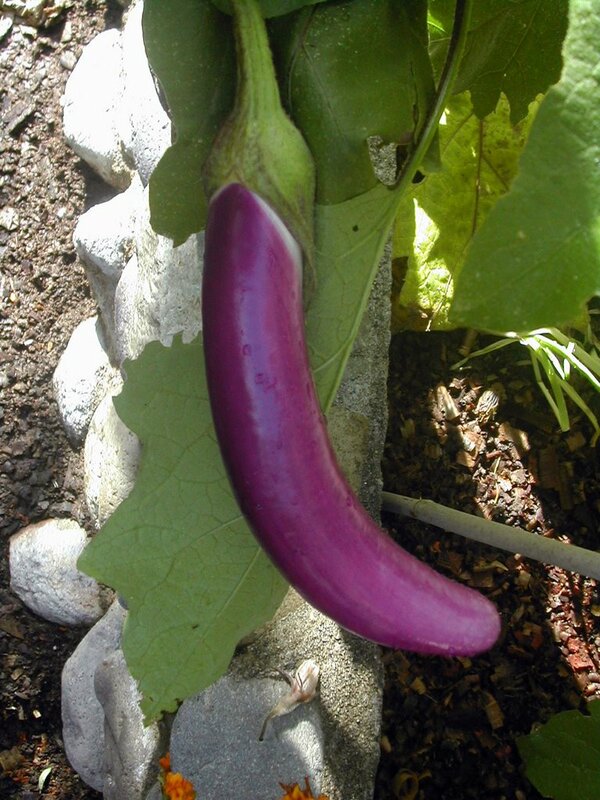 They often have seven to nine eggplants at a time and quickly begin producing anew after those are harvested. The 8 to 10" (20-25 cm.) fruit grows very straight which is nice for slicing. They haven't shown any sign of bitterness even when I've left them on the plant for days. "An open-pollinated oriental eggplant variety, imported from Taiwan. Fruits are elongated and slender, averaging 10" (25 cm.) long and 1 1/2" to 2" (4-5 cm.) across with a lovely, lavender-purple colored skin and white interior flesh. This variety has been bred to be resistant to many diseases, as well as tolerant to wet and hot conditions. In our 1995 trials, we found this one to be the best yielder, with fruit weighing about 1/2 lb. (.23 kg.) each." I found this description to be fairly accurate, although my (admittedly unfertilized) fruits have been just a little smaller in diameter and weight. Pinetree is located in Maine, U.S., and my garden is in tropical Honduras in Central America, so apparently it has a wide climate tolerance. The plants have stood unsupported and healthy among tomatoes that succumbed to bacterial wilt and squash covered with mildew. It wasn't even particularly bothered by insects until I pulled out all the other plants around it. Something is eating big holes in the leaves now but it hasn't affected the production yet. Our favorite way to prepare Ping Tung is to cut it lengthwise into 3 or 4 slices, brush the slices lightly with olive oil, sprinkle with kosher salt, pepper, and fresh thyme leaves, and then broil or grill for just a few minutes. We've also used it sliced or chopped in frittatas, omelets, and stir-fries. I think this tender eggplant is best cooked very lightly. It's too bad that the beautiful skin fades to a tan color when cooked. I found a fabulous sounding recipe using cilantro and basalmic vinegar from The Chocolate Lady. She says this recipe is "so delicious your eyeballs can just explode into atoms." Wow! I can't wait to try it. I have read that in order to save seeds from eggplant, the fruit must be way past prime eating quality. I plan to try to save some seeds, but if I leave a fruit to over-ripen now I think it will stop further production. So I'm going to wait a while and enjoy more of the harvest first. 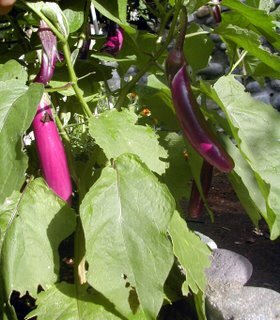 Even if your family is not completely crazy over eggplant, you should try Ping Tung for its mild flavor and beauty. These can also be grown in containers. Next time, I may plant them in the front yard − they are that pretty! We woke up this hot Sunday morning to find we have no electricity. It is 87°F (31°C) with 84% humidity at 9 a.m. That's usually about a "feels like 99°F" from Weather.com. Not that we would be cooler if we had power − we never use the A/C during the day − but we do have ceiling fans in most of the rooms and that helps a lot to make you feel more comfortable. Usually when the power is scheduled to be off there is a warning in the newspaper the day before so I get up early to make the coffee. 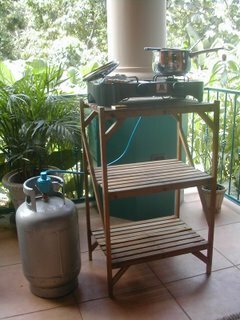 This time there wasn't, so I made coffee on our 2-burner propane stove. It wasn't very good, but at least it gave me that jolt that I need in the morning. Oh, for a Starbucks and an ice-cold frappuccino! I think I'll write them to tell them about the thousands of tourists dying for Starbucks in La Ceiba. It could work. Although I did once write WalMart, as a stockholder no less, to ask for a store and didn't get any kind of decent response other than "check our website." I then type it up and edit it later on the computer. It makes me feel less pressured when I have a little inventory of articles in the works. Especially for those times when I'm not in the mood to write or don't have any inspirations. It is amazing to me how many bloggers write about other blogs. Some write about bloggers who write about bloggers who .... well, you get the idea. What's the point? It's very common not to have power on Sundays in Honduras. La ENEE (the government-run power company) says that they perform maintenance on those Saturdays and Sundays, trimming trees that interfere with the lines or changing out wires or transformers. I always think that it is just a ploy to save electricity because why else would the power be turned off sometimes in more than a third of the country to trim a few trees or change a line or two? I've also noticed that since our new president came into office in January, there haven't been any scheduled Sunday outages. La ENEE either no longer performs maintenance in La Ceiba or no longer cares how much electricity we are using. There have been many more unplanned outages than the year before so maybe they do need to do some maintenance. Oops, I have to go fill the pila (concrete wash sink) before our neighborhood water tank runs out of water. Grab your sunscreen because we are going on a trip to Trujillo today! These pictures are from a trip El Jefe and I made three years ago and another trip I made in 2000 before moving here to Honduras. 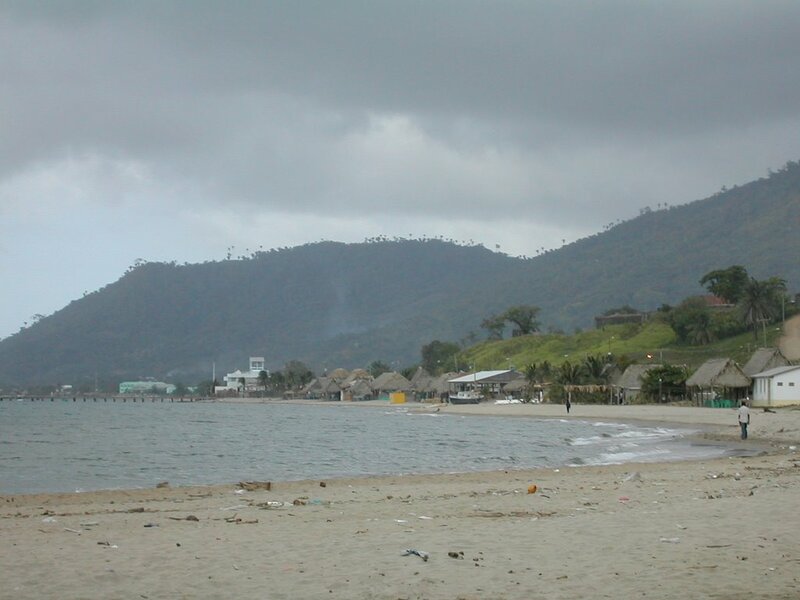 Trujillo (pronounced true-he'-yo) is one of the four largest towns (including Puerto Cortés, Tela, and La Ceiba) on the narrow, flat plain north coast of Honduras. Trujillo is a sleepy, little coastal town of about 30,000 people, a nice place for a quiet get-away. Christopher Columbus arrived in Trujillo Bay in 1502 during his last trip to the Americas. The town of Trujillo was founded in 1525 by the Spaniard Juan de Medina but it wasn't colonized by the Spanish until some 20 years later. 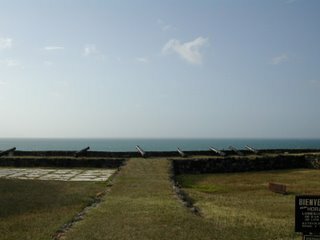 The Fortaleza Santa Bárbara was built in 1590 in a largely unsuccessful Spanish effort to defend the colony against British, French, and Dutch pirates. 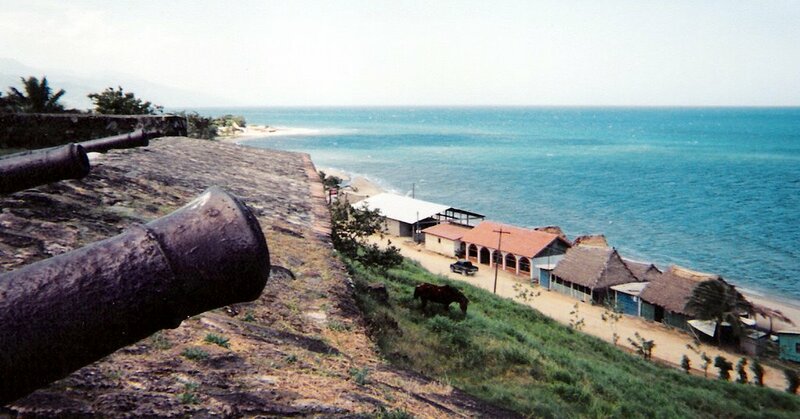 Trujillo was sacked and burned by pirates and totally abandoned on several occasions leaving virtually no trace of its Spanish Colonial heritage except for the decrepit remains of the fort. Those cannons are 300 or 400 years old. It is amazing that they haven't completely deteriorated from the salt water and humidity. If you are into forts, Omoa has a better one. The picture at the top of this article shows that below the fort are several champas (palm-frond covered huts) housing restaurants and bars on the beach. In the early 1900's, North American companies Standard Fruit (Dole) and United Fruit (Chiquita) both acquired lands in the area. 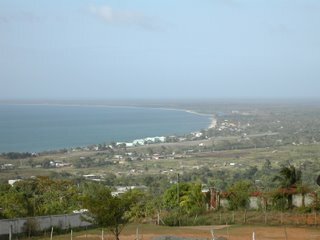 Dole still owns much of the land around Trujillo today; in fact, Dole controls much of the land in the entire north coast. The economy of Trujillo today is still largely dependent upon the banana industry, as well as the (mostly failing) tourist industry and the activity of the nearby port, Puerto Castilla, where Dole still ships most of its produce to the U.S. and Europe. Traveling to Trujillo from La Ceiba means a four hour hot, dusty bus ride or a 45 minute picturesque but somewhat scary plane ride along the coast. We flew there and took a bus back to see some of the countryside. The plane ride was definitely better. Interestingly, our direct flight to Trujillo was sidetracked to include a stop on the Honduran tropical island of Guanaja to drop off some passengers. Trujillo is a nice little town for a laid-back, relaxing vacation. Not much to do there except lay on the beach and drink piña coladas while you decide where you will eat dinner that night. Guided boat tours of the Guaymoreto Wildlife Refuge lagoon provide an opportunity to view birds, monkeys, alligators, and other wildlife, if you are lucky. 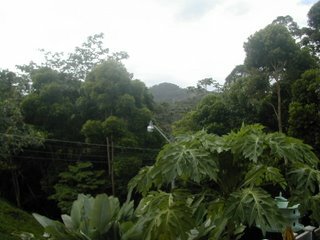 This and the next picture were taken from the window of our first hotel room at the Villa Brinkley Hotel. We changed hotels three times and only stayed at this hotel one night. The hotel advertises itself as a "Complete Spa and Resort Hotel with a gourmet restaurant and the best view of Trujillo." The view of the bay was pretty but the hotel was so depressing. Dark and dusty, I think it was empty except for us. We went to the hotel restaurant for dinner and we waited so long that I think the waiter must have gone into town to get the cook to come back to work. The little house is typical of houses in small towns or the poorer areas of larger cities. They are usually one room with a curtain drawn across the middle to separate the sleeping area from the living and cooking area. It doesn't appear to have electricity or running water, like so many of the houses here in Honduras. 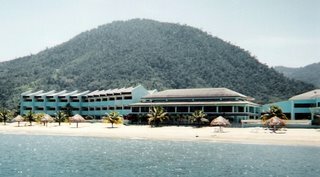 This is the front of the Christopher Columbus Hotel on the beach a couple of miles outside of town. That concrete in front of the hotel is the airport runway. Well, just runway would be more accurate because there is no airport. It's very convenient, though. You just climb out of the plane and walk across the runway to the hotel. No need for a taxi. ;) Pack light, though, because no one will come out of the hotel to help you with your luggage. The Christopher Columbus hotel is the best and most expensive in Trujillo, but that isn't saying a whole lot. We have learned to never rent a hotel room in Honduras until we have looked at it and checked that the lights and air conditioning work and that it has running water in the sink and shower. Not all do! Even though this hotel was virtually empty, too, they managed to assign us a room with no lights in the bathroom and a shower that didn't work. The beach and the restaurant are nice, though. But you can use the beach and the restaurant and stay at the La Quinta hotel (no relation to the U.S. chain) just the other side of the runway for about half the price and it's not a bad hotel either. 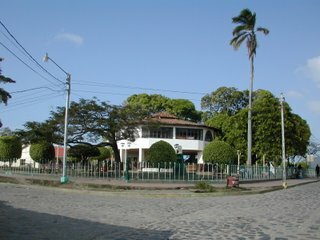 Every town of any size has a Parque Central (Central Park) located on the main street. The park is jam packed with people on Saturdays. Hondurans like order, so they always put up fences around their parks and concrete curbs around the sidewalks within so that you know where you are allowed to walk and where you aren't. There are some of these 'cobblestone' streets in parts of La Ceiba, too. The Catholic church is near the central park, as they are in most Honduran towns. 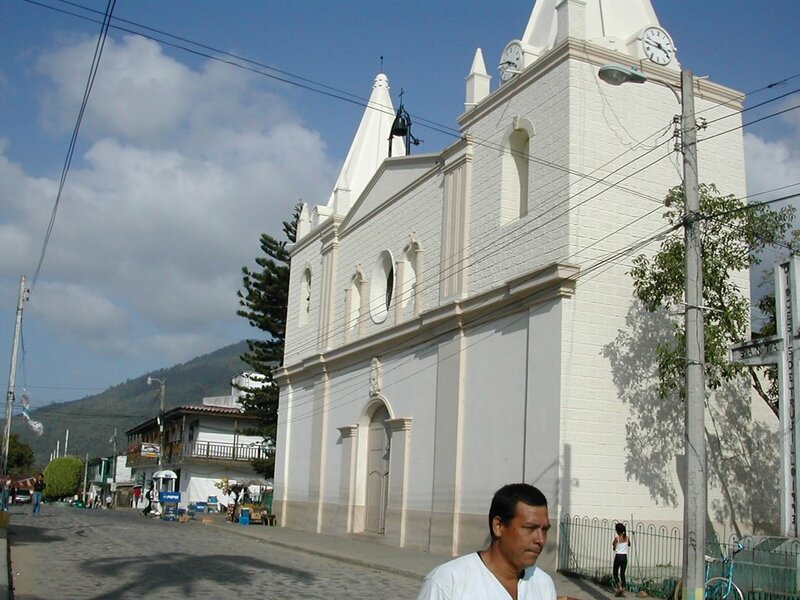 Trujillo was the site of the first cathedral in Honduras, but it was destroyed long ago. This one was originally built in 1832 and was remodeled 1930-1939. Trujillo wants to be a tourist destination, but as you can see from the look of beach in town, they don't work at it very hard. The beach could be attractive with all the champas, but it really needs some sprucing up. 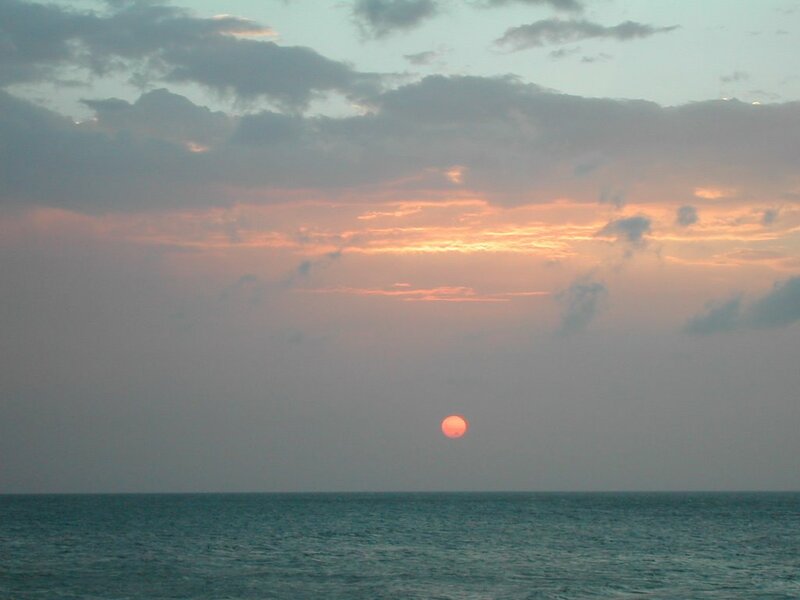 The last picture is sundown over the ocean. I hope you enjoyed your tropical paradise trip! 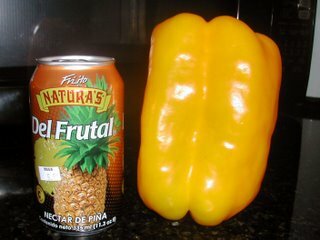 Wow, look at the size of this chile! It measures 6" long by 4" wide (15 cm. x 10 cm.) and weighs over a pound (454 grams). This is the part where I'm supposed to tell you what variety it is and what techniques I used to grow such a whopper.... So sorry, in an effort to be an absolutely truthful blogger, I have to tell you that I bought it at the grocery store and it wasn't labeled. I won't think about the amount of chemicals it must have taken to produce this mutant chile. 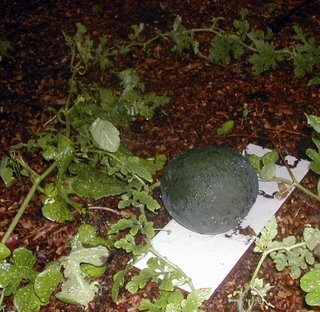 Man, look at the size of this melon! .... Oh, here we go again .... I really did grow this one, but through the miracle of photography, I have made my 2 1/2" by 3 1/2" (6.5 cm. x 9 cm. ), 11 ounce (312 grams), Minnesota Midget melon appear to be a jumbo-size cantaloupe. The melons have not done well at all (cucumber beetles, squash bugs, mildew, and a neglectful gardener), but I'm going to save seed from this open pollinated variety to see if the next batch will be better adapted to this climate. This melon sounds like a great variety for tight spaces. It is supposed to have compact 3 foot (1 meter) vines which produce 4 inch (10 cm. ), one-serving size cantaloupes. Sounded like a good idea to me. I'm not sure that growing any fruit with the word 'Minnesota' in the name is a good idea in the tropics, but I will try it again because I'm intrigued by the small size. I did have a colossal watermelon but it was pre-blogging days and I didn't take a picture. I grew Moon and Stars (an Amish heirloom variety). 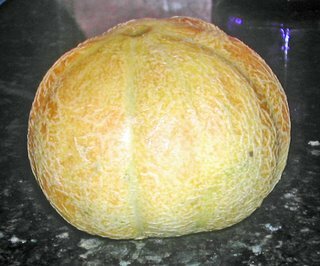 The name comes from the small and large yellow dots (moons and stars) that speckle the rind as well as the foliage. My first one was 28 pounds (12.7 kg.). 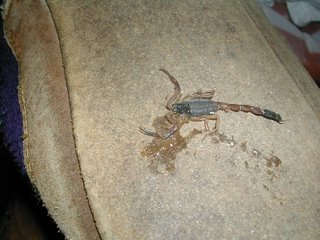 This picture is of a smaller one. The tile underneath is to protect it from millipedes. We had an unusually rainy "dry" season during the time the melons were ripening, resulting in fruit with not much color or flavor. I will try this variety again next year during the dry season and hope for better results. I'm only 5'1", but suddenly I feel like a tall person. I kind of like it. I feel more authoritative. All of my life I've stared into people chests, had to block the sun from my eyes when I looked up to talk to them, and felt claustrophobic in a crowd because I couldn't see in front of myself. Now I've become an average, or even, dare I say it, tall person. People are very small in Honduras. I often stand eye-to-eye with the men and positively tower over the women, especially the older people. Oh, of course, there are tall people here, too, but the majority of the people are much smaller than North Americans. Especially the poor people. I suppose it is partly in the Mayan genes, but mostly, I think, it's from life-long malnutrition. When those same people move to the U.S., they have giant children. El Jefe has a nephew, born to the good life in the U.S. He was taller than me when he was 10 years old. Now he's 15 and almost 6 feet tall. El Jefe's mother is about 4'9". That is only a slight exaggeration of my grocery list − I don't go to the hardware store to buy avocados, although they are sold there on occasion. 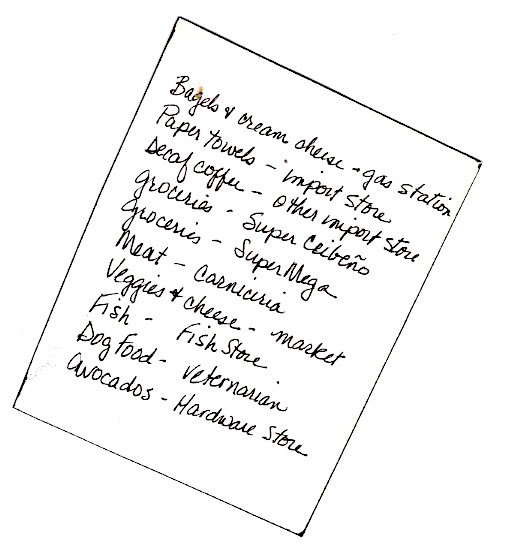 My grocery lists never, ever get checked off and thrown away the first time. There is no one place that will have everything — ever! Even the most ordinary of supplies, like sugar or coffee, can take two or three trips to the store because: no hay (there aren't any). Sugar and coffee are produced in this country − it makes no sense! There are a few things that I've had on my list for years. I transfer them to a permanent wish list. It includes, among other things: Dijon mustard, chocolate chips, dill relish (apparently only sweet relish is approved for importation here), and fresh mushrooms of any kind. You know, real exotic things. ;-) I find Dijon mustard every year or two. Chocolate chips − I found those once in December 2002, but I didn't notice that the package had melted and rehardened into one giant glob of chocolate. Mushrooms are available about once per year. Don't misunderstand − we have two large, modern grocery stores, relatively well-stocked and clean, mas o menos (more or less). It's just that what a store carries one week doesn't mean they will ever have it again. I drink a lot of iced tea in this hot and humid climate. The stores seem to stock tea bags about every three months and if they run out after two weeks — well, that's it for the next two and a half months. So I buy four or five hundred at a time and maintain my own inventory. If I'm going to eat canned tuna, I like it to be chunk white tuna packed in water. Well, I waited three and a half years for a tuna sandwich. When I finally found it, I bought 18 cans even though it cost three times as much as the oil-packed versions. Blueberries are grown in Honduras for exportation and maybe for the big cities of San Pedro Sula and Tegucigalpa. Wherever they go, the grocery store powers-that-be have decided that we in La Ceiba are not worthy. Overall groceries are very inexpensive in Honduras. Some examples (in U.S. dollars): ground beef $1.70 per pound, mystery cuts of beef $2.10 per pound, pineapples 40 cents, avocados 27 cents, sugar, flour, rice, and beans about 30 cents per pound, bananas and lemons, about 5 cents each. Most vegetables are 40 to 60 cents per pound, but the variety is very limited. All items except for the most basic foods carry a 12% sales tax. I haven't bought groceries in the U.S. for five years, so I really don't know how these compare. I do remember paying $5 U.S. for a pineapple! It is crucial to check the expiration dates. 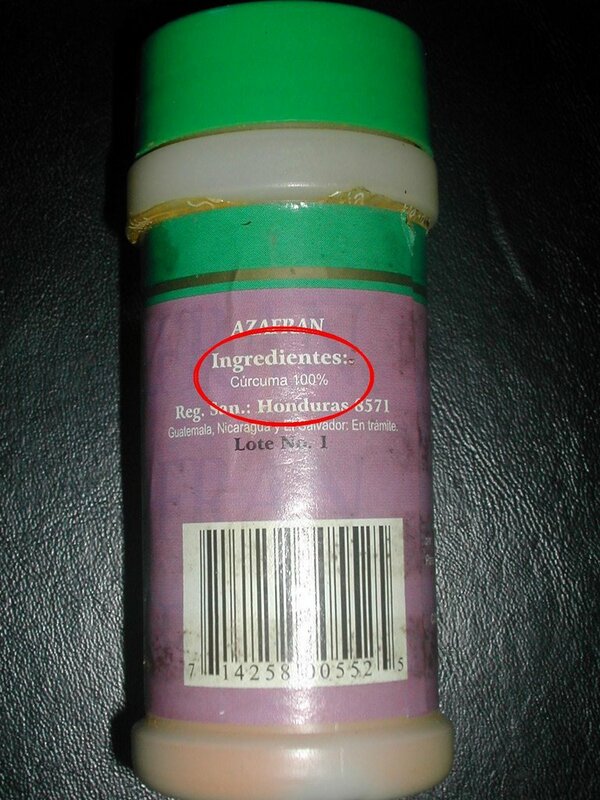 Sometimes I think that when some products get too old to sell in the U.S., they are exported here to Honduras. For example, cream cheese: In the U.S. when you buy cream cheese, the expiration date is usually about six months away. Here I've never seen it more than three weeks away. Pretty suspicious to me. Worst of all, if it doesn't have a date, that means that it IS expired and the store employees have scraped the dates off of the packages. True, I've seen it being done. I also cannot make any assumptions about the food I buy or that I will be charged the price on the label. I can't assume that the product is fresh, edible, bug-free, or even that it is what the label says it is. Of course, in this case, I knew that I couldn't buy a whole bottle of saffron for 75 cents! So many of the things that we take for granted in the states are apparently considered luxury items here because the price is three or four times as much as in the U.S. One example is paper towels — $2.50 to $3.00 a roll. Plain old American cheddar cheese costs $6.50 per pound and European cheeses can be as much as $15 per pound if they have them. Sometimes I just do without things because I feel like the price is such a rip-off and other times I splurge. A few months ago I found dried cherries, L.350 for a 20 ounce bag (about $19). No kind of cherries, fresh, frozen, or dried, are ever available in La Ceiba except that goopy canned cherry pie filling. I couldn't resist. El Jefe thought I was crazy, but I made cherry muffins and cookies several times, doling out those cherries like they were made of gold. I'm always on the lookout for English-language magazines. Every now and then, I find a boring Better Homes and Garden or a Newsweek. Once I went into a gas station store to buy hamburger buns and happened to notice that they had a Cook's Illustrated magazine! I ran out to the car with tears in my eyes to tell El Jefe. Again, he thought I was crazy. The store is not a WalMart or anything close to it, but I noticed immediately that it was cleaner and smelled better. I'm still hoping that we will get a real WalMart someday − they are all over Mexico. (Don't say it − if you were HERE, you would wish for a WalMart, too.) I can't imagine being able to go to one store to buy potting soil or vitamins or cleaning products or contact lens solution or books or magazines like I used to. I would be in heaven. Now only if Home Depot would come.... No, I mustn't be too greedy. I'll settle for a WalMart. Last night a storm came in and suddenly a bolt of lightening struck somewhere right outside my studio window. It was an explosive "CRAA — ACK!" like I've never heard before and for a moment the studio was lit up like a WalMart parking lot. I literally jumped out of my chair and held my breath thinking that my computer would burst into flames. A few seconds later we heard a deafening roar of thunder. My little chihuahuas, who usually just shrug off these tropical storms, came running to me for protection. But nothing happened. We didn't even lose power. I went outside to see if I could see any damage. I think it must have hit the ground. I didn't find anything but I brought Chloe the Rotten Rottweiler inside for safety just in case. Later on we did have our daily power outage — very frustrating for a blogger. I've read in La Prensa that some parts of the country are so badly wired that it takes no more than a small bird resting on the wires to cause an outage. Apparently we live in one of those areas because we have had outages almost every day for the past two weeks. "I cut open a thick rind to reveal six snowy white, almost translucent segments that were like little eggs nestled in a jewel box. The flavor was almost unbearably exquisite - a sweet-tart melding of elegance and opulence that had echoes of fruit of every climate. Think of cherimoyas, lychees, and peaches mingled into one soft, moist, fragrant mouthful. 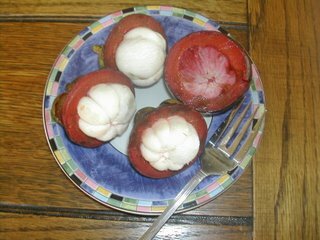 I understood at last why many people consider mangosteen the finest fruit in the world-and why Queen Victoria is said to have offered a knighthood to anybody who could bring her one." They were for sale yesterday at the local grocery store for the very first time that I'm aware of. It seems that a local engineer grows them for export (so what else is new? ), but this time decided we lowly Ceibeños were Mangosteen-worthy. Hooray! They cost 2 lempiras each here (about 10 cents). After doing some research, I found that this is the proper way to cut and serve the fruit. It does look more attractive this way, doesn't it? Recently, a company has been promoting a mangosteen juice which costs $39.95 for a 25 ounce bottle! Another company sells a 'bargain' version, $24.95 for a 32 ounce bottle. If nothing else, this should tell you how good this fruit is! I'm not going to promote these companies by naming them, but I will tell you that they make wild claims about the health effects of this juice. I intended to say that they claim it does everything except cure cancer, but then I read further and it seems that they hint at that, too. It is true that the fruit is high in vitamins and anti-oxidants and has been used in many folk remedies for hundreds of years. But I don't believe the rest of that stuff for a minute. Garcinia mangostana L. is a native tree of Malayasia and now is widely grown in southeast Asia, India and to a lesser extent in Hawaii and many other tropical countries in the Americas, Africa and Australia. It has not been successfully grown in Florida or California. 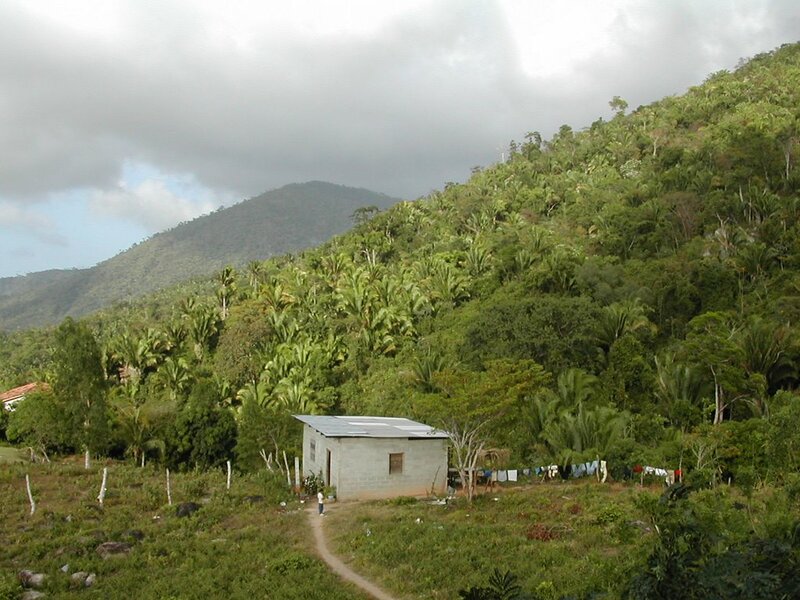 Honduras is said to have one of the largest plantations in the world (500 trees) at the Lancetilla research gardens. Started in 1927, it still produces fruit today. Despite the name, mangosteen is not related to the mango family. The fruit is the most generally esteemed of all tropical fruits, called the queen of the fruits in many countries. The tree is grown only in tropical areas that have heavy rainfalls. It is a dense shade tree, nicely pyramidal in shape, growing from 30 to 80 feet tall depending on the soil and climate. It fruits twice a year but not reliably so in climates that don't have a sufficient dry season. CURLA recommends it be grown in Honduras only from sea level to 500 meters in areas with at least 2 meters of annual rain. In other areas it has been grown to an altitude of 1,500 meters. The most unusual fact about mangosteens is that they are dioecious but apparently no one has ever identified a male tree. Like many mysterious things in nature, the female tree has adapted and found a way to reproduce. You might logically ask: "If mangosteens are so great, why don't we see them in the U.S.?" Good question, since all things good generally go to the U.S.
Fresh mangosteens are forbidden by the U.S.D.A. 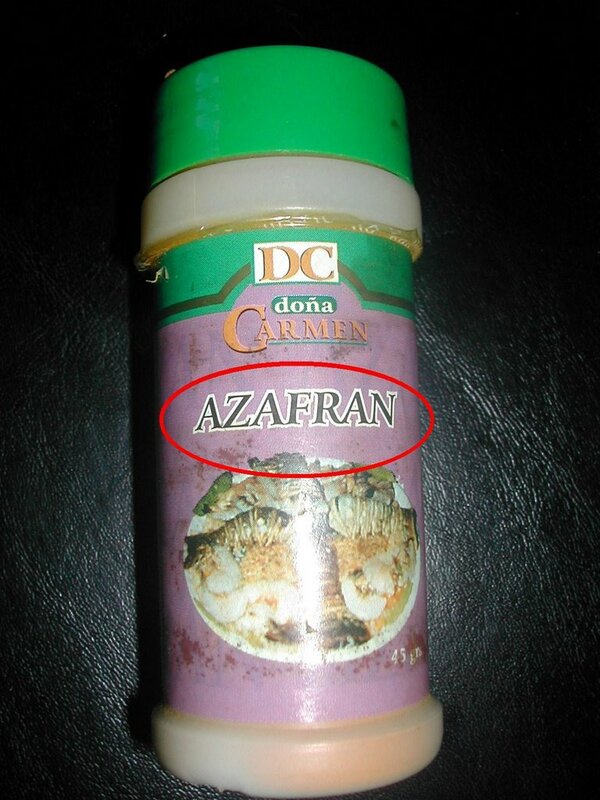 for importation from southeast Asia due to the possibility of importation of fruit flies. Currently, the fruits may only be imported from Puerto Rico and 18 Central American and Caribbean countries, none of which have many successful commercial growers. A change has been recently proposed to allow importation of irradiated fruit from Thailand. Mangosteens must be harvested fully ripe and the fruit does not ship, preserve, or process well. It is a slow growing tree, requiring shade for the first two to three years. Tests over the last 75 years have proven that it cannot be reliably propagated vegetatively so growing from seed with the resultant long wait, is the best alternative. It can take 8 to 10 years, sometimes even up to 15 years, to produce fruit. The first few years of harvest can range from 300 to 500 fruits, increasing to about 500 for a full grown tree, and reaching optimum production of 1,000 to 3,000 fruits after 20 to 30 years. It takes a patient and optimistic farmer to decide he wants to grow mangosteens for profit. 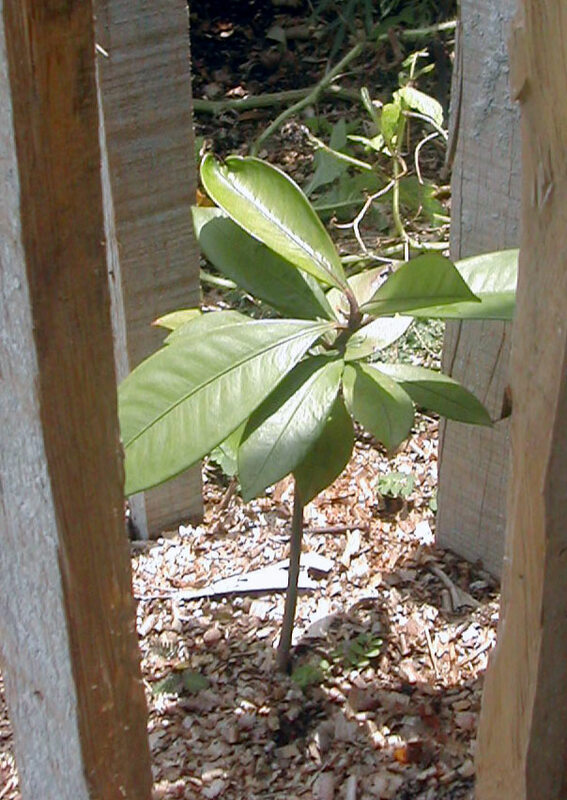 This is a picture of my mangosteen tree. Actually it is better described as a Mangosteen twig. The wood slats around it are for Rottweiler protection. After reading all the research, I realize now that I need to give it more shade. It is not a well-known tree in Honduras. CURLA, the national agricultural university of Honduras, grows and sells a few plants to the public. Sadly, only these very small trees are available. 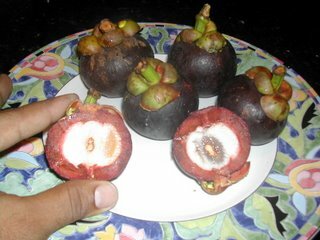 The price was right, though: L. 20 (about $1.05 U.S.) In Honduras, mangosteens typically do not fruit until the 8th year so I have a very long wait for mangosteens of my own. If you want to know more about mangosteens including it's history, culture, and folklore, check out Fruits of Warm Climates. 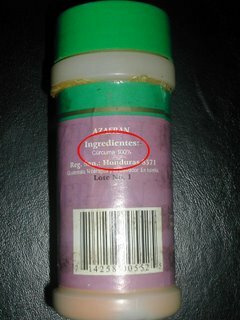 For the straight scoop on those juice products, see Science, Nonscience and Nonsense at Mangosteen.com. Mangosteen.com also provides some interesting, well-documented history of the mangosteen, including a 1855 story of a greenhouse-grown tree in England that produced its first fruit after 22 years of growth. The author also debunks the Queen Victoria story above. If you come to Honduras in 2014, stop by La Gringa's house and I may be able to offer you a mangosteen juice − for free! I'm new to blogging and it has apparently become a very, very big thing since my 4-year hiatus from the internet. See: "Ah! The luxuries of life" in my July Archives. It's not that I didn't have any internet access, I just didn't have convenient access resulting in very short trips to the internet cafes with no time to surf. In my recent searches for information on tropical gardening (not 'growing tropical plants in non-tropical areas' which is most of what I found), I have run across some great gardening blogs. That's what inspired me to become a blogger. Some of my favorite blogs are those of gardeners who are struggling like I am to figure out what they are doing, rather than those of the experts, although those are great, too. We all need experts. Gardener in Mexico is one of my favorites because the author is an American trying to learn about gardening and the life in Central America, as I am. 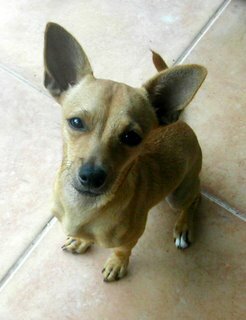 Yucatan Living is another site that tells of the life in Mexico, which in some respects is similar to Honduras. I'm enjoying a new blog called Garden Rant, where they are "uprooting the garden world" and are bored with perfect magazine gardens. Who can't relate to that? Rather than me giving you a long list of blogs that are of interest to me − although I may do that later − here are some sites where you can pick out your own favorites. The Subterranean Homepage News has a long list of "More gardening blogs than you have time to read." Each entry has a short description which usually includes the location of the gardener. You are sure to find one that fits your interests and/or gardening climates. Garden Voices is a great site to get acquainted with a variety of gardening blogs. The site has an ever-changing group of the latest blog articles from selected sites and in the right-hand column has a list of hundreds of gardening blogs. A blogger who has spurred several other articles on gardening blogs lately is Hanna at the This Garden is Illegal blog. She has a great article, Yes, you are allowed to leave a comment on a gardening blog, that is dear to my heart and has prompted to me to leave a comment or two on sites that I have been visiting. I hope you'll read that one and drop me a comment here! It is nice to know when someone is reading. Now the hardest thing about finding so many interesting blogs is keeping up with them. I'm learning that there are lots of ways to keep up with your favorite blogs. There are free news readers such as NewsGator, Bloglines, or dozen of others which bring the newest articles of your favorite blogs to your browser or desktop. You can easily add the "feeds" to your personal Google homepage or MyYahoo page. If you use GMail, which I'm most familiar with, you can also add a feed to your GMail webclips which will notify you of the latest articles on your selected sites. (Even I have figured out how to do this! )Blogs often have little clickable icons in the sidebars which will automatically add the blog's feed to the program you use. I'm afraid I haven't learned how to do this yet, so you are on your own here! Sorry! I feel a little silly talking about these technical things of which I obviously know almost nothing about. I'm just assuming that some of my readers may be gardeners rather than bloggers and I hope this information will help lead you to some of the real experts who can help. If I only had a laptop, I could do my blogging here! I miss having real gardening friends. I have some internet gardening friends and have recently begun corresponding with the delightful Gardener in Mexico. Not that they aren't real people! My internet friends help to fill the void but there is nothing like a friend stopping by to stroll the garden to see what's new and leaving with a bag full of cuttings or vegetables or seeds. Even better is when that friend is a gardener experienced in the area. Most people I've met in La Ceiba aren't that interested in gardening. They hire someone to take care of all those things and never get their fingernails dirty. And the only suggestions I ever receive are to buy this or that deadly chemical which is sure to solve all of my gardening problems. Gardeners I've known are the most generous people, always willing to share advice and plants. I've had extra plants from dividing, some very large and nice plants. I tried to give them away because I really hate to see plants go to waste. Most people acted like I was asking them if they wanted my old worn out shoes or something. Now I just compost them instead. I've seen some plants that I would love to get cuttings or seeds from but I never have the nerve to ask. The culture is different here and I'm afraid I would be treated like a street beggar or something. Maybe not, but I don't want to find out. It's almost impossible to identify plants here unless I already have some idea of what it is. Nursery plants have no labels and the names given by the workers mean nothing outside of Honduras, things like cangrejos rojos (red crabs) or amigo de la iguana (friend of the lizard). In Honduras, every plant with a bulb or corm is called a lily, sometimes further defined as pink lily or red lily. I have several gardening books and of course the internet in which to research, but sometimes you have to have some clue as to the name or family or it's just impossible to identify. I'm not an organic evangelist, but on the few occasions when I've tried to talk to people about the benefits of organic gardening or the danger of chemicals, they just look at me with pity and I can just hear them thinking, "Poor gringa, too bad that she doesn't know about all these wonderful chemicals!" A veterinarian told me that they wouldn't sell these things if they weren't safe. Ha! I guess he doesn't know about all the 'cides that have been taken off the market because they have been proven not to be safe. Well, actually he does know about some of them but he thinks it is just American extremism. Oh well, at least I have El Jefe. He loves the garden and he's a convert to organics. I guess I'll just keep doing what I'm doing and maybe they will come. Meanwhile, I hope you enjoy strolling through my virtual garden. Why do they have to get so big? 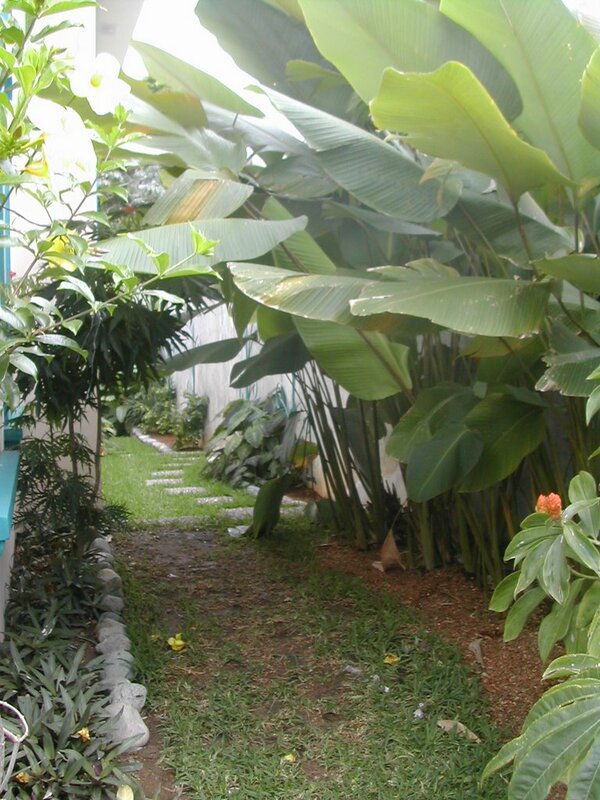 I've had lots of tropical plants over the years. Most were kept in gallon-sized pots and babied through the winter, never growing very large because they were usually set back by the wrong wintertime conditions. Now when I buy some of these same tropicals and plant them in the ground here in hot, humid La Ceiba, they grow to be 8 or 10 feet tall and sometimes as wide. When I gardened in Dallas, I remember looking for varieties of plants and flowers that would grow fast to make a more instant impact on the landscape. Here in the tropics I have the opposite problem. So many plants get too tall or too wide too fast and I never seem to leave enough room for them. You will never see one of those manicured magazine cover gardens here. It's impossible! These pink gingers on either side of the front gate need to be divided every year because they get so overcrowded. And we have to cut them back every few months because they start blocking the gate. They do have a wonderful fragrance when they get smashed in the gate, though. This picture was taken in July 2006. I planted this red ginger on both sides of the porch. I thought it was a dwarf type − my mistake. They were only about 6 inches tall when I planted them. Look at the old photo below from May 2005. They were the little short plants at the base of the column on the porch. We've already dug out several and replanted them elsewhere. Who knew? 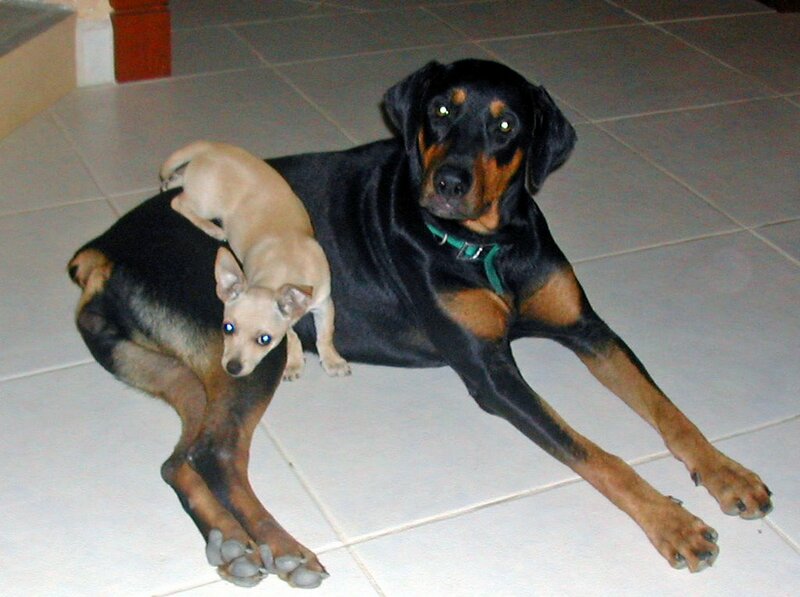 This is the before photo taken May 2005. To give you some perspective, the birdbath is in the same place in the photo below. This Etlingera elatior (common name here is Bastón de la Reina) was a scrawny stalk when I planted it a year and a half ago. You can see it in the old photo above to the right of the birdbath. I've thinned it heavily twice and now more drastic measures are needed. It's coming into the windows of the studio, growing across the front porch, and climbing over the roof. It gets the most beautiful flowers. They look as if they are made of wax. I have another one that is red, also planted from a stalk that my neighbor ripped out of the ground for me in the most brutal way. It's planted in an area where we almost have to crawl to get around it. This Calathea lutea grows wild near the creekbed. Three years ago I dug up three 3 foot tall plants each with only 2 to 3 leaves when we didn't have anything in the yard. The flowers are ugly − reddish brown drying quickly to brown − but I thought the large bluish-green leaves would help shade the windows on the west side of the house. They do, but they also block the walkway so that you need a machete to whack your way through this jungle. In the jungle by the creek they grow narrowly upright with only a few leaves, trying to reach the sun. In my garden, they reach up and out as well. We ruthlessly prune these every couple of months to no avail. The photo at the top of this article is of the east side, where they also block the walkway. I'll probably take out all of these eventually. They just aren't very well-behaved. I'm learning as I go and will probably be doing a lot of rearranging as I make more mistakes. One benefit to this quick growth is that I rarely need to buy more than one of any kind of plant. Another is that I always have plenty of composting materials. Oh, by the way, all of these plants were free, stolen from the creek or given to me as cuttings. Drinking ice water makes you sick. All other illness stems from pressure (high blood pressure) or sugar (eating it? or diabetes? I'm not quite sure about this one.). Coca Cola will cure a backache. Hamburgers may be safely stored at room temperature for up to two days. Red beans are the only edible variety of bean. White corn is the only edible variety of corn. Sinks and toilets are not clean until all of the white is scrubbed away. 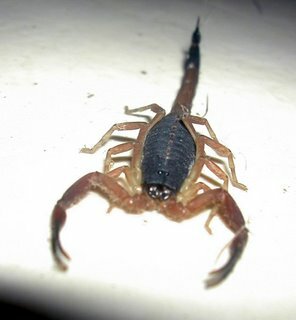 If a black butterfly enters your house, someone will die. Central America is where all of the old unsafe yellow school buses go to begin life anew. Women still wash clothes on rocks in the river. Cars can actually be kept running for 25 or 30 years. Snakes like to live indoors, too. Polio, measles, mumps, and tuberculosis still exist. Mosquitos are the most dangerous critters on earth. La Ceiba gets something like three meters of rain a year. Maybe more. I don't think anyone really keeps track of it. And where we live, I guess because we are closer to the mountains, we often get rain when they don't in town. I know that in December 2005 we received more than 20 inches in four days. 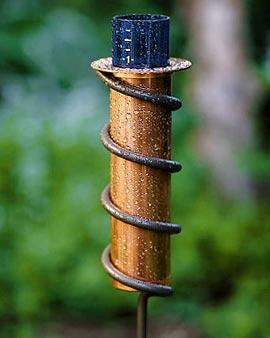 I had a 5 inch plastic rain gauge and it overflowed every day. Since then, Chloe the rottweiler decided it would make a nice snack. I need another one! A big one. I've been searching the internet, and do you know that no matter how large they are, almost all rain gauges only measure 5 or 6 inches of rain. I have an idea to make one, an attractive one of glass and iron (non-snack materials) that would measure 12 or more inches. Kind of like this without the copper. But like most of my ideas, it may be another year or so before I get around to it. I should do it now, though, before the real rainy season starts. In town, an hour of rain can, and often does, flood some streets to knee level − hip level after a few hours of heavy rain. Our house is on the highest street in the colonia and our property and the areas around us have good drainage, so we never have to worry about flooding, thank goodness! We only have to worry about rain coming in the windows. For some reason I don't understand, rain usually comes after 4 p.m. During the dry season, we rarely get more than a sprinkle during the day. Even during the rainy season, it is more apt to rain in the late afternoon or evening, although it can rain for days on end. The past two months, we generally have received at least one good heavy rain and several smaller rainstorms a week. We've only had to water the yard a couple of weeks in May. It seems an unusual amount of rain to me but maybe it is only because we have been painting the outside of the house and have noticed the rain more. .... we know that rain is imminent. 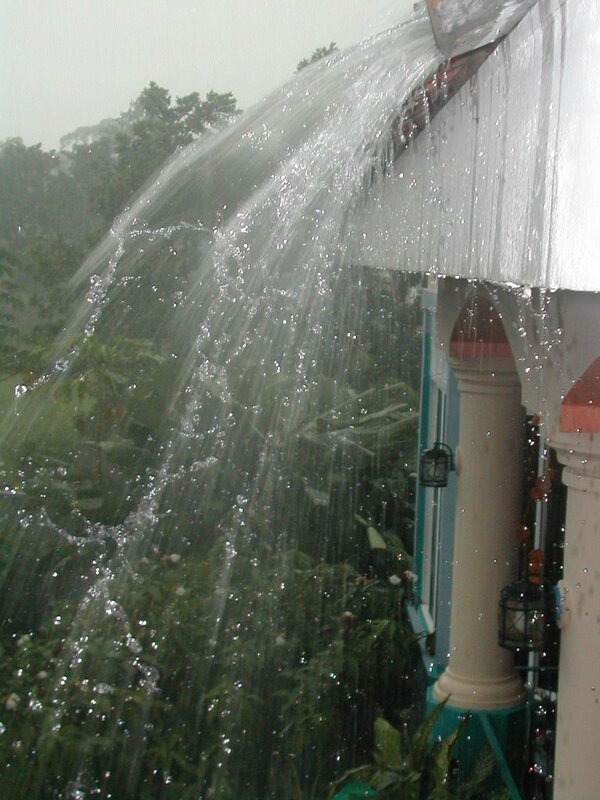 This is a picture of an average rain coming off the roof. I feel selfish with so much rain (during the dry season yet!) so give me your location and I'll send it to you. 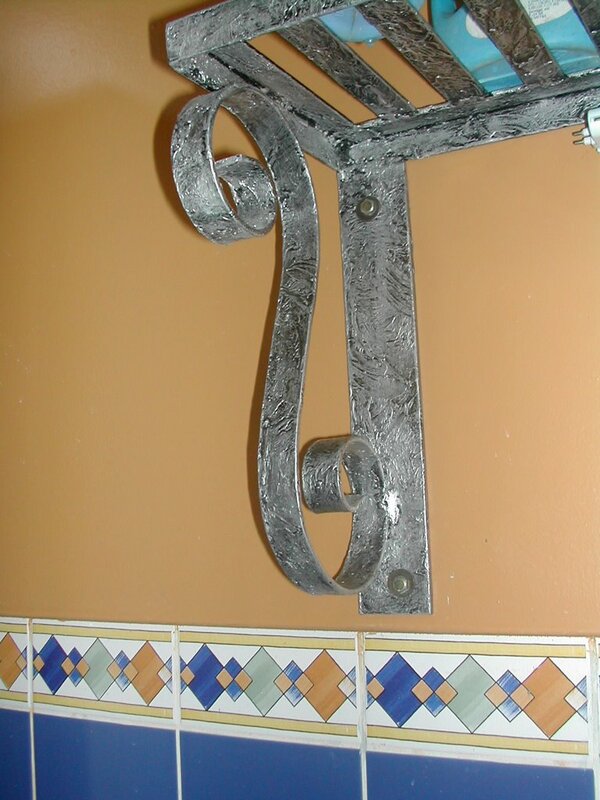 We use lots of metal and tile in Honduras. In this climate, wood just doesn't hold up very well, inside or out. 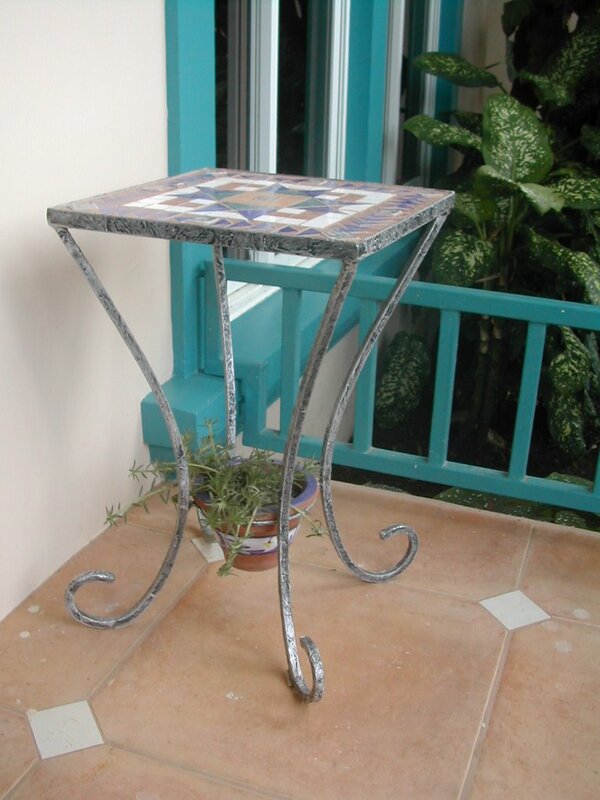 There is only one store in La Ceiba with metal furniture and decorations. In my opinion, the products are highly overpriced for the quality and the styles are, well, not my style for the most part. Soldadores (welders) tell you they can make anything you want but how do you tell them what you want when they don't have samples and you don't have a sample to show them? And what you tell them you want and what they end up making are usually two very different things. So I was forced to make my own designs on graph paper with detailed measurements and material specifications. He still made mistakes....many of them. 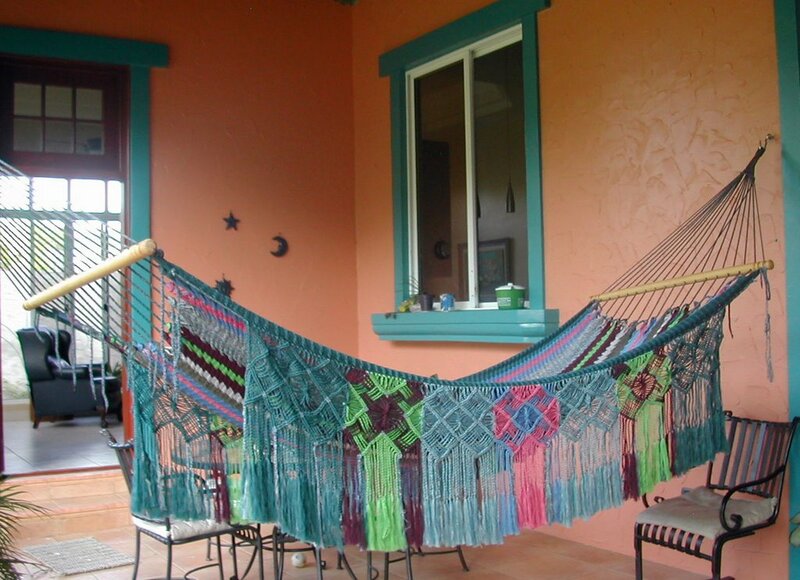 This is the design that we used on the terraza (terrace) railings. I found a design that I liked in a magazine but it just wouldn't translate to these shorter railings so I developed this design from that picture. The top picture is of our front gate. It is definitely one of a kind − at least until the welder copies it for another client. ;-( I wanted something less unfriendly than the heavy iron bars that make me feel like I'm in prison. 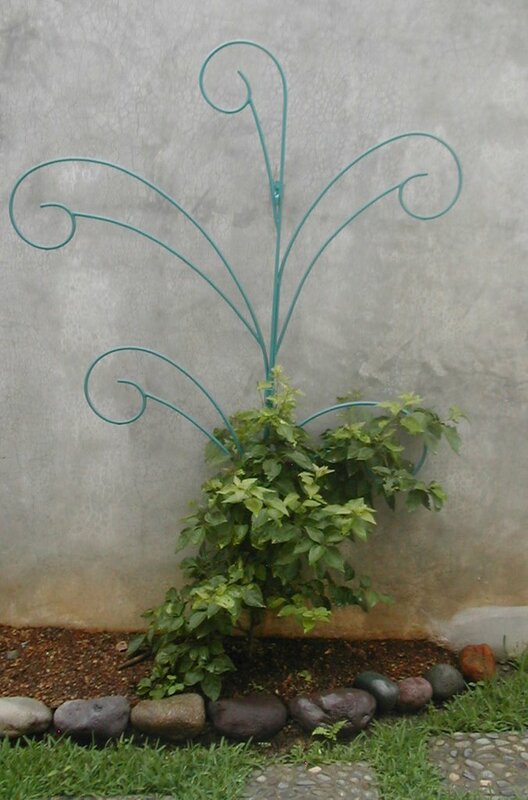 I adapted this design from the railings. 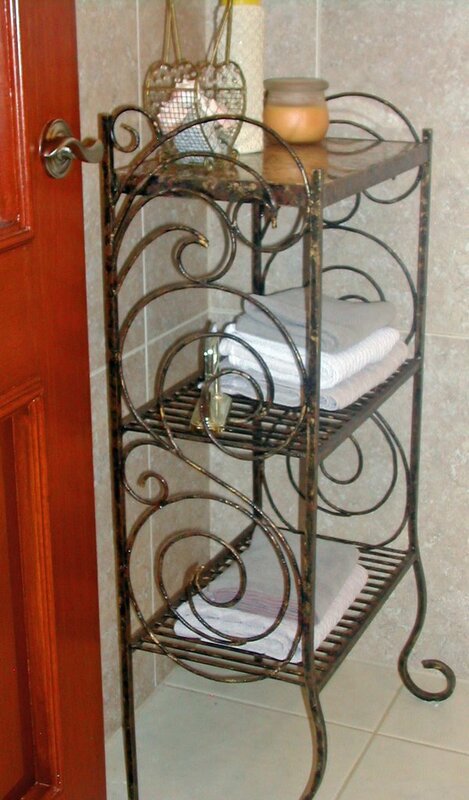 We needed a shelf in the half bathroom to store extra towels and things so I designed this little shelf to fit a leftover piece of granite for the top. The metal was primarily scraps left over from construction. I gave it an antique look by sponging black, brown, reddish brown, and a little bit of gold paint all over it. Because these paints were only available in high gloss, I finished by dabbing the entire thing with paint thinner to dull down the gloss. 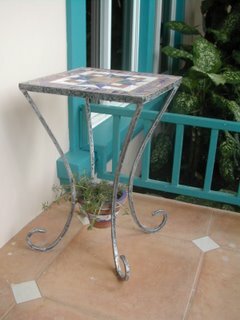 This is one of a pair of small tables that sit on our front porch next to the hammock chairs. I saw a similar design in a magazine and adapted that to fit my flower pots. 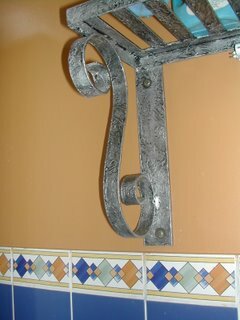 I "antiqued" the metal by texturizing it with spackling paste and rubbing a light coat of silver paint over black paint. The top of the original magazine table was made of colored glass in a floral design. I made these tops with leftover tile scraps using a quilt pattern called Mexican Star. Clever! I have other tile projects in mind and will use quilt patterns again since quilt piece shapes are easily cut from tile and there are so many interesting designs. 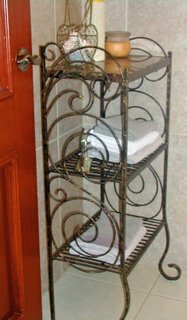 We needed a shelf in the laundry room to store detergents and things so I designed this shelf and used the same antiquing technique on the metal. This was also made from scrap metal. 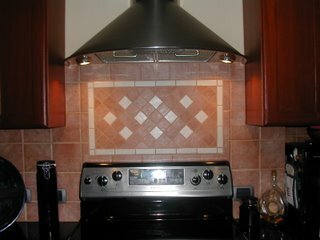 When our kitchen cabinets were finally installed, we couldn't get our tile man to come back to finish the job so we tiled the kitchen walls ourselves. 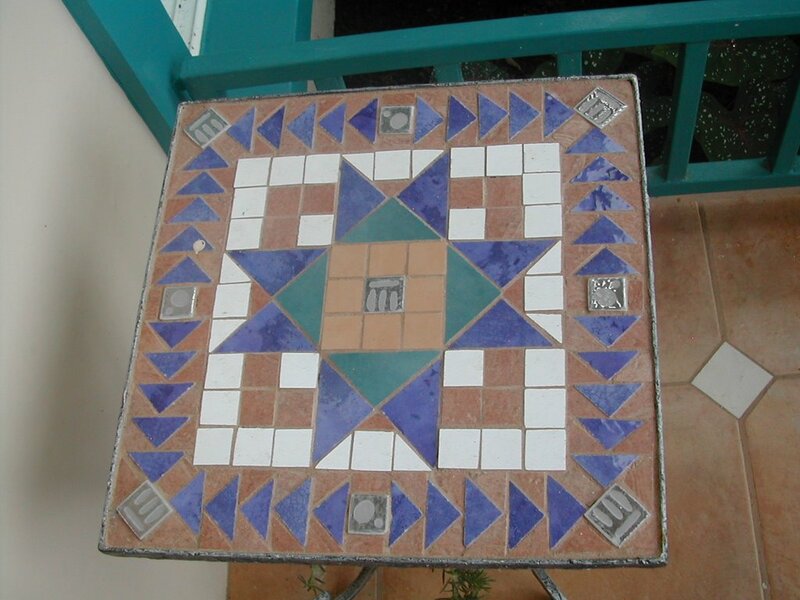 This is a little design I made by cutting mosaics out of floor tiles. It is a simple design but adds a little interest to this area of the kitchen.